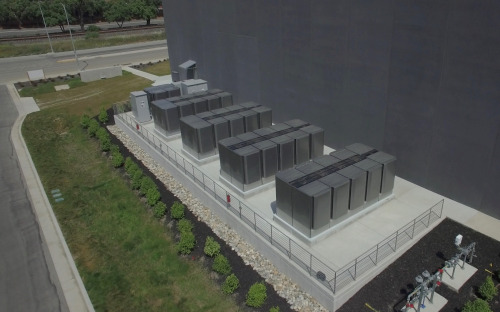 California-based colocation data centre company Equinix is installing Bloom Energy solid oxide fuel cells at 12 International Business Exchange™ data centres across the US. The project will provide a total capacity of more than 37 MW, with installations beginning later this year and continuing through 2019. Fuel cells will be installed at seven Equinix IBX data centres in Silicon Valley in California, three in the New York area, and two in Los Angeles. It builds on the 1 MW pilot programme that began in 2015 at Equinix’s Silicon Valley SV5 IBX data centre. Equinox also has fuel cells at two IBXs in Los Angeles and New York acquired from Verizon this year, so the new project means the company will have more than 40 MW of fuel cell power at 15 locations. The new project is financed through Southern Company, and reflects the strategic partnership between Bloom Energy and Southern Company to support onsite fuel cell solutions, which kicked off last autumn when Southern Company subsidiary PowerSecure agreed to acquire an estimated 50 MW of Bloom Energy Servers under long-term PPAs. Two years ago Bloom Energy announced a partnership with Texas-based Vapor IO for distributed ‘green’ data centres. Bloom recently installed two more SOFCs for IKEA in California and Connecticut, and supplied the power plant for an independent fuel cell microgrid in Hartford, Connecticut.